Complete integrated hotel room automation combined with connected DND solution. Our DND solution consists of two innovative touch screen panels mounted inside and outside of the hotel room. We can deliver different types of panels to feature design as well as specifications that suit any of our costumers’ wishes and requirements. The entire solution can also be connected to the smarti integrated system to automatically receive all the necessary data right at the assigned department. This is a complete integrated room automation solution, providing simple and intuitive temperature and humidity control, light management, curtain/shade control, music etc. 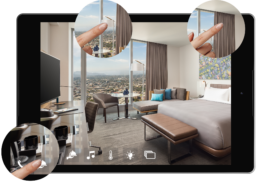 It is connected to the entire hotel’s integrated system providing all of the required functions right on one smarti controller. Every action can be completed only by touching the desired module on the screen. For example if you want to control curtains, just drag them on your tablet screen and the command will be implemented. And so it goes for music, light switching and dimming, service ordering etc. 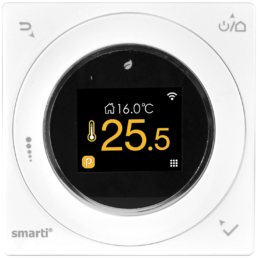 Room temperature is controlled via smarti intelligent thermostat. It is connected to the system wirelessly and can be fully customized. It can be controlled manually as well as wirelessly through smarti automation controllers. We can also enable humidity control if desired. Our energy saving switches help reduce energy consumption as well as improve guest comfort. The actual time when the energy meaning lighting, cooling, heating etc. is needed is significantly lower that the amount of time the room is actually booked. Our energy saver functions as the main electrical switch for the entire room and is operated by smart card key. All lighting and heating facilities only become operational once a corresponding card is inserted in its card key switch. We are also providing intelligent safes that represent the highest level of security and integrity. We can deliver different safes required for any type of the project.